I was a very sick child from a young age. I had severe asthma and, as a result, I was hospitalized three or four times per year. I was told that I would not be able to get involved in sports or any type of physical activity. My health was always a major concern to my family. At the age of 15, my parents separated. This was extremely hard on me. I began drinking, taking drugs and doing whatever I could to escape reality. I was very angry with my father and I blamed him completely for what had happened (I know it was two sided, but I blamed him). When I was 18, my mom (who I stayed with after my dad left) passed away unexpectedly. I was left alone to raise my brother who, at the time, was 15 years old. This added to my anger. I felt like, if there was a God, why would He let all these things happen to me and to my family? I directed a lot of anger towards God for this. When I was 24 years old, I got a job at Scotiabank, where I met the woman who would later become my wife. She was attending a church and, after a few months of dating, told me, “I will never let you come between me and my faith.” This really hit me. I had never heard anything like that before. I wanted to know more about the church she was attending and this faith that was obviously very important to her. I attended the church with her one Sunday morning and was touched immediately. I continued to attend and, four weeks later, I gave my heart to the Lord. I immediately felt a load lifted from my shoulders. I saw everything in my life in a new way. The same God that I blamed for all the bad things in my life came into my life and erased the pain I was feeling. I felt a renewed hope and peace come over me. I no longer felt that I needed to carry the pain and regret. I have been a Christian now for 17 years. God has always been faithful in my life. I have renewed health. I take part in 56k bike rides annually and do 5k runs once or twice a week; exercise is lifestyle now. I am doing exercises that I was always told I would never do as a result of my failing health. I have a great relationship with my Dad, and I have seen numerous miracles in my family over the last 17 years. I have been blessed over and over again in this amazing walk with God. I have a wonderful family and look forward to a great future! 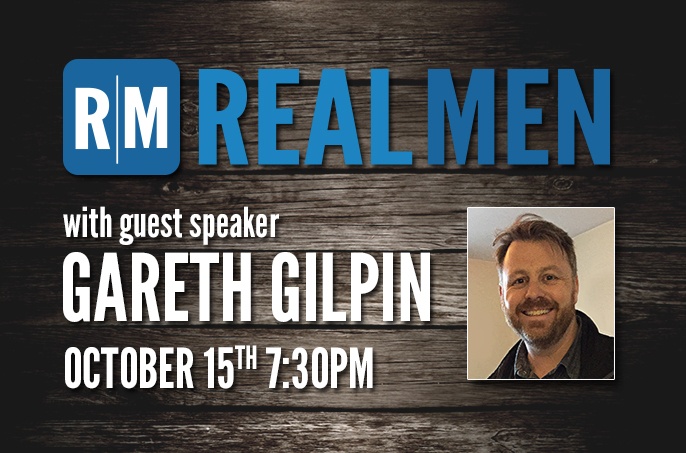 Join Real Men with Guest Speaker Gareth Gilpin on Thursday, October 15th 7:30PM at 1045 Garth Street, Hamilton. Gareth Gilpin has served as a pastor at Redeemer Church in Albany, NY for the past 8 years. Prior joining the Redeemer staff he served at City Bible Church in Portland, OR. Gareth is an avid cyclist, but his real passion is seeing the Gospel transform people’s lives. He has been married to his wife, Jennie, for 20 years and has three amazing children, ages 16, 14 and 11. Get ready for an action packed 2015 with REAL MEN Hamilton. 2014 was a great year and each event was well attended and full of laughs. From the hockey tournament at the start of the year to the soccer tournament at the end of it, guys enjoyed getting together with a united purpose. The Burger Throwdown and Bike N’ Burgers events were major hits, with over 100 guys coming out to eat and vote for their favorite burger. The Nacho Burger was a clear winner! This year we’re looking to build on these successes, and open the invite to all men in Hamilton, and surrounds, to come out and enjoy REAL MEN events. If you volunteered at an event last year we want to thank you. We couldn’t do it without you. If you participated, check out the dates below for 2015 and invite your friends out. We invite all men, of any age, to come join us as we look to build something together to positively affect our communities. Bring your family out to the Get Reel Fishing Derby in May. Dads, Mums, kids, and grandparents will have a blast, with lots of prizes to be won. Below are the exciting events planned for this year. More details will follow shortly. Christmas is all about giving. Just as Jesus was given to us on Christmas Day, we can give to others during this season, or at anytime during the year. 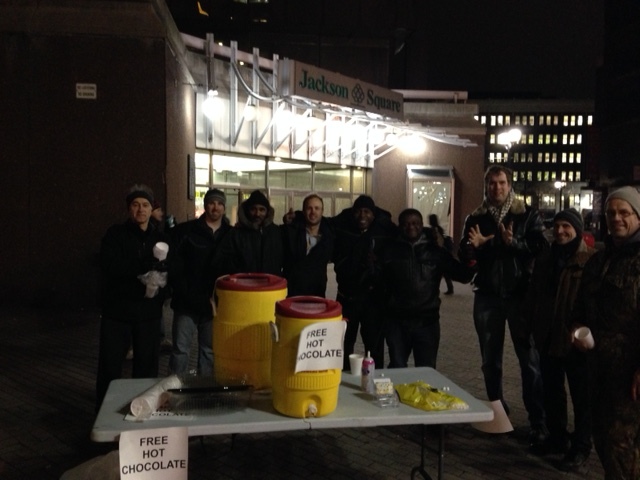 REAL MEN Hamilton has been putting giving into action in 2014, heading downtown, and loving on people in our great city. Free water in summer, hot chocolate in winter, and some of the best corn you’ll ever taste during corn season. The response has been great as Hamiltonians grab a drink, eat corn, and stop to chat. 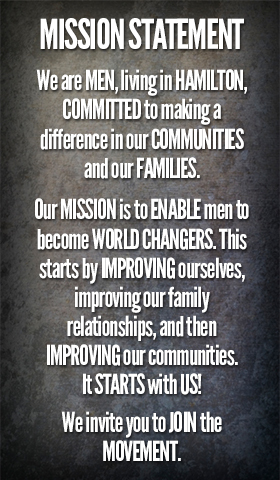 Most are pleasantly surprised that there are real men making a difference in Hamilton. How can you make a difference in someone’s life by giving?